to satisfy your equipment repair needs. Keep your valuable equipment up and running with scheduled preventive maintenance and repair. 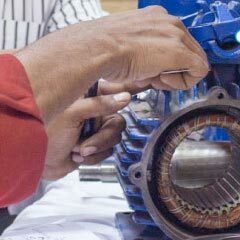 InnoCal provides electrical and mechanical repairs for a variety of equipment and instrumentation. Our factory-trained technicians have more than 45 years of combined experience in diagnostics, troubleshooting, and repairs for both laboratory and industrial process instruments. To supplement our expertise, we maintain an extensive library of operation and service manuals, engineering documents, and schematics. We also communicate with manufacturers regularly to stay informed of the latest service and operational issues. What's more, our vast inventory of OEM parts ensures that repairs are completed quickly and accurately. Peristaltic pumps, diaphragm pumps, metering pumps, and centrifugal gear pumps. Our Masterflex® Preventive Maintenance Package ensures optimal performance, prevents unplanned failures, and extends the useful service life of your Masterflex® tubing pump. pH/ion, dissolved oxygen, conductivity, ORP, humidity, and temperature including thermocouples, RTD, and thermistors. pH/ion, dissolved oxygen, conductivity, and ORP. Ovens, water baths, flame photometers, viscometers, and centrifuges. Gas monitors, electrical, sound meters, light, air velocity. In addition to repairs, our technicians can also create custom devices to handle your unique applications. InnoCal currently creates more than 70 unique systems for customers working in many different processes.